Knock medical student Rachel Lyons has been honoured with the prestigious James Massey Keegan Scholarship from NUIG. 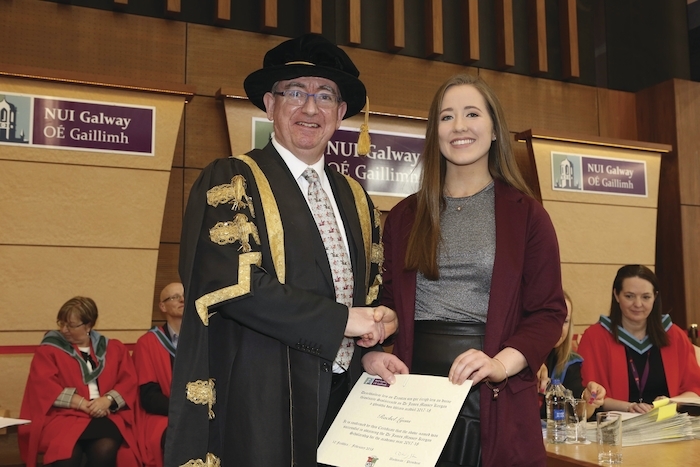 She is pictured receiving the award from the president of NUIG Ciarán Ó hÓgartaigh. The organisers of Daffodil Day are looking for volunteers for Daffodil Day in Kiltimagh on Friday, March 23. Anyone interested in helping out for an hour or two on the day can ring (094 ) 9381636 or (094 ) 9381413. Moy Davitts is establishing a new Gaelic4Mothers and Others team. It is a fun, non-competitive, social outing for mothers and non-mothers (over 21 ) of all fitness levels. The team will meet once a week (Mondays at 8pm ). It is a great way to learn a new skill, meet friends and new people and get fit. Register your interest by texting (087 ) 9034267 or by contacting it on Facebook (Moy Davitts Mothers & Others ). The first training session is Monday, April 9, in Srath Garbh, Foxford. Registration is from 7.30pm. The first six weeks are free and if you like what you see you can fully register for €20. So whether you just want to get back into playing or have never kicked a ball, why not try it out? Go on, you know you want to. The Football Association of Ireland is holding a Kick Start/PDP 1 coach education course in the CBD Centre, Charlestown, on Thursday, April 26, and Thursday, May 3, from 6pm to 10pm on both nights. Participants must attend all modules of the course in order to qualify for certification. This course is designed to assist beginner coaches, parents, and teachers to introduce young children (ages six to nine ) to fundamental warm up activities, basic activities and fun games in a safe, structured, and stimulating environment. Course fee is €45. This course is limited to 24 participants so book early to avoid disappointment. To book a place on the above course log on to http://bit.ly/2enBbLe and book online. Please note all bookings must come through the online booking system. The 67th Swinford St Patrick's Day parade will be held tomorrow, March 17. The parade will commence from the Swinford Amenity Park at 3pm. The parade organisers invite everyone in Swinford to get out and celebrate the day and to co-operate with the organisers and gardai to ensure that everybody has an enjoyable and safe day. The prize giving presentation for the winners of the parade awards will take place on Sunday, March 18, in the Gateway Hotel in Swinford at 8pm. The Annual JJ McHugh Memorial Tractor Run in aid of Mayo Roscommon Hospice takes place on Easter Monday, April 2, commencing at 2pm from Julian's of Midfield, Swinford. Registration takes place at 1pm. All types of tractors, vintage, and trucks are welcome. Entry fee is €20. Contact Mary on (085 ) 7477678 or Jarlath on (086 ) 4045133. Donations are very much appreciated. A Self Care to Wellness morning programme will get under way on Tuesday, March 20, in Charlestown Library. If you have a long term health condition this programme may be of interest to you. This is a six week programme delivered in 2.5 hour weekly sessions where you will learn new skills to manage your health condition on a day to day basis. This programme will commence on Tuesday, March 20, in Charlestown Library and will run from 10.30am to 1pm. Participants must register in advance as places are limited to 15. The ninth annual Kilmovee 10km takes place on Saturday, March 31, at 1pm. The event will start at Kilmovee Shamrocks GAA Club with the proceeds going to Kilmovee Shamrocks and the Mayo Roscommon Hospice palliative care service. There will be cash prizes for all categories, and refreshments will be avilable after the race in the community centre. You can register online at kilmovee10k.com For more information email [email protected] or call (094 ) 9388666. If you would like an item included in the East Mayo Community Diary, email [email protected] with the item by 5.30pm on the Monday before publication.